Dozens of parents, students, school district personnel and community members roamed the halls and new classrooms of the Columbia County Education Campus Tuesday night. 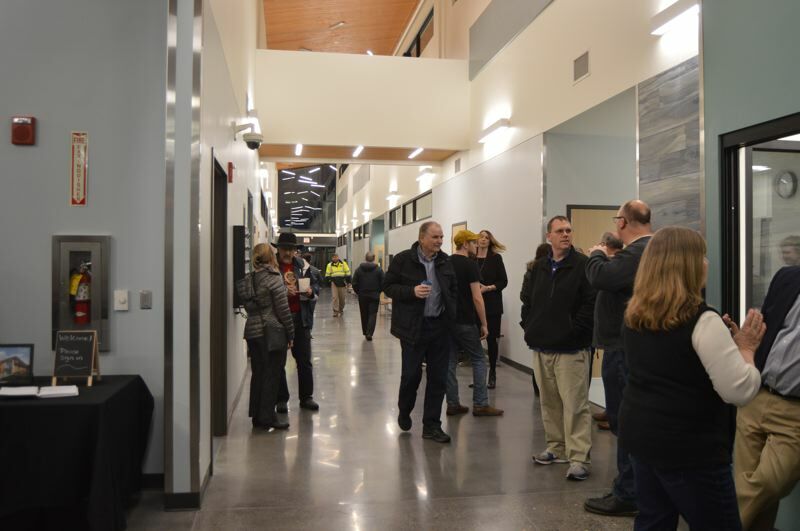 The St. Helens School District hosted a two-hour open house at the alternative high school's new facility on Jan. 22 to provide the public a chance to see the district's newest building up close. The brand new building was completed as the first phase of a $49 million voter-approved bond initiative in 2016 to construct a new alternative high school, which opened its doors earlier this month. The second phase of the bond project is the completion of a new middle school now under construction. Adam Wies, a language arts teacher at CCEC, joked that the event was bigger than parent-teacher night. Wies said there are features he likes and some he's not so keen about, but overall it's a positive change. Students at CCEC were previously housed in portable classrooms behind the district office. "Generally, I think it's amazing," Wies said. "And I've never had a new classroom, or a classroom this nice, and I've been teaching for 12 years." Overall, he added that many students seemed appreciative of the new building, and parents showed the same reaction. "Their faces really light up and they didn't do that on parent-teacher night," Wies joked. "It's time we got a real school." CCEC students Edward and Destiny Mercer, a freshman and junior, respectively, attended the event with their mom, Jessica. "I'm excited for my kids. I'm excited they feel like they're actually part of the school district and they don't feel like a castoff," Jessica Mercer said. "They actually like coming to school now." Edward and Destiny Mercer felt the same way, and were enthusiastic about being in a new building that feels unified and spacious. "It's nice to have something shiny and new," Destiny Mercer added. "I'm grateful the community chose to put the kids first. We keep saying we need to put youth first and it was nice to see them do that and put their money where their mouth is," Jessica Mercer noted. The new building has the capacity to house 120 students, with roughly 20 children in each of its six classrooms, noted Superintendent Scot Stockwell. Between 80 and 90 students are enrolled in CCEC and currently occupy classrooms, leaving room to grow. Each classroom is also outfitted with technology that supports a 21st century learning environment, Stockwell noted. The rooms house projectors with touchscreen ccapabilities, iPads that function as portable document cameras, as well as a speaker system that allows a teacher's voice to be broadcast so that students can clearly hear instructions. While the new space is larger, junior Rylie Mundy said she misses the more confined space of the old CCEC classrooms. But, with features like individual single-stall bathrooms and personal lockers for cell phones in the hallways, she's learning to get used to her new school. "I do like the lockers because it makes me learn," Mundy said, noting that teachers don't allow phones in the classrooms. She said the new school's larger cafeteria is also growing on her. "I'm not used to having a big cafeteria," she added. "I'm slowly getting used to it." For Alison Charbonneau and Rhonda Larson, teachers at St. Helens Middle School, Tuesday's open house also provided the chance to consider not only the new CCEC building, but also what might be in store for the new middle school currently under construction. "The current middle school is so old. It'll be nice to have something shiny and new and have have it be better organized to suit learning," Larson said.